Planetary systems are dynamic places. Some planetary orbits change over time, moving the planet either closer in towards the star or further out. Not only that, but the stars in the centre of planetary systems will eventually evolve off the main sequence, growing into giants and then, in most cases, collapsing into white dwarfs. This can significantly change the planetary system as a whole, in some cases leading to planets being swallowed by their host stars or ejected from the system. Of course, these changes occur over timescales of millions to billions of years. 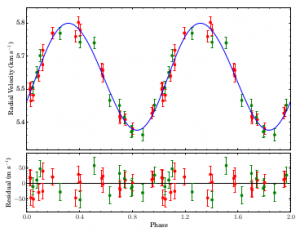 There has recently been a spike of interest in what happens to planets as their host star evolves, inspired by the discovery of a system of disintegrating planets around a white dwarf. Today’s paper introduces TYC 3667-1280-1, a Jupiter-mass exoplanet whose host star is in the process of evolving into a giant. The authors believe that the planet is of interest not only because of its evolving host, but also because of the planet’s potentially revealing migration history. Planets of Jupiter mass, like TYC 3667-1280-1, are thought to form far out in the system, where there is more material from which they can form. However, we have seen many Jupiter-mass planets which are incredibly close to their host star, often much closer than the Earth is to the Sun. Consequentially these systems have very short orbital periods. The so-called “hot Jupiters” have orbits shorter than 10 days, while “warm Jupiters” have orbits of 10-100 days (compare this to Jupiter’s orbital period of 12 years). How did these planets end up so close to their host stars? 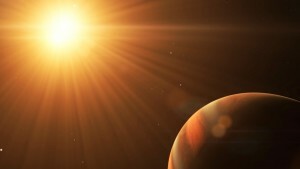 Warm and hot Jupiters may have travelled inwards by different means. Jupiter-mass planets can migrate inwards by being gravitationally pushed to high eccentricities (highly elliptical orbits). However, many systems in both classes have orbits with very low (their orbits are almost perfect circles). In hot Jupiters, the planet’s orbit can be “circularised” again by the gravitational pull of the star — however, this doesn’t work as well across the distances at which warm Jupiters orbit. How, then, do we explain the low eccentricities in some warm Jupiters? There’s also a second mystery around warm Jupiters. We see fewer hot and warm Jupiters around evolved or evolving stars than we do around main sequence stars. For hot Jupiters this is easily explained: for most of these systems, the planet is close enough to have been swallowed by its host star. However, warm Jupiters are further out from their stars, and so we would expect them to last longer than they seem to. Both of these problems might be explained by an effect known as the Kozai-Lidov mechanism. This is a tidal effect that occurs in hierarchical three-body systems – that is, systems in which two of the bodies (in this case, a star and a planet) are in a tight orbit around each other, with a third object in a wider orbit around the two (a potentially unseen companion such as a brown dwarf). If the orbit of the outer object is tilted relative to the orbits of the inner binary, the gravity of the outer object pulls on the inner pair in such a way that the eccentricity of their orbits fluctuates. (For more detail on the Kozai-Lidov mechanism, see Erika Nesvold’s section in this astrobite.) The low-eccentricity warm Jupiters that we see could simply be those in a low-eccentricity phase of these fluctuations. Conversely, when the planet fluctuates up to a highly eccentric orbit it will pass much closer to its host star, causing it to be swallowed by the expanding star much earlier than it would be if there were no Kozai-Lidov mechanism in play. In fact, for a sample system their simulations showed the planet might be swallowed by the time the star grew to 5 solar radii, compared to 40 solar radii for the same system with no Kozai-Lidov mechanism. Enter TYC 3667-1280-1, whose star has a radius of 6.3 solar radii — putting it just inside the range of what should have been swallowed if the Kozai-Lidov mechanism is at work in this system. In other respects TYC 3667-1280-1 appears to be a typical warm Jupiter, having the low eccentricity (0.036 in this case) that could imply the Kozai-Lidov mechanism is at work. Further studies of TYC 3667-1280-1 could help clear up this seeming conflict, as well as helping us to understand the Kozai-Lidov mechanism further. Figure 1: Radial velocity curve of the star of TYC 3667-1280-1, showing an almost perfectly circular orbit (eccentricity is 0.036). The orbital period of this system is 26.5 days, and the maximum mass of the planet is 5 Jupiter masses. This image is Figure 1 from today’s paper.